The Great Wall is an opening strategy which wasn't invented by Bruce Wilcox but is explained in his book Ezgo - oriental strategy in a nutshell. It is a kind of fuseki experiment. The idea is to build a big wall of stones stretching from one side to the other, defying all conventional opening strategy. Dieter Verhofstadt (1k): Seemingly silly, it is remarkably effective. Two reasons: one is that if the opponent sticks with conventional opening moves, they turn out to be suboptimal. According to a professional player, White should prevent the wall from being perfected. The other is that your opponent will tend to underestimate you, because you play such "silly" moves. Bill Spight: How about an example of the suboptimality of a conventional opening move? 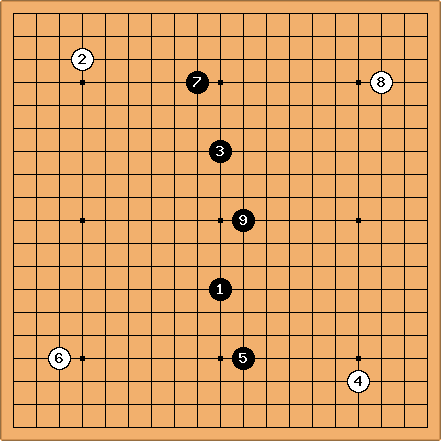 Hu: A third reason for its effectiveness: Black often ends up with only one group. I second Bill Spight's request for examples of sub-optimal moves. To me this "big wall" looks hard to use. If white closes corners Black will have a hard time making effective use of the wall. Also, the wall itself is thin, consisting entirely of large knight spaces between stones. I imagine it is a problem for a lot of white players because they aren't used to dealing with non-standard moves. If it were really so good I think there would be a lot more pros playing it. I've had trouble defending against this attack (precisely because I'm not used to dealing with non-standard moves). What's a good strategy for white in this situation? Alex Weldon: It's a fighting formation for Black, giving Black lots of power, but little territory or moyo potential. Therefore, all White needs to do to win is play thick moves, and not allow Black the opportunity to start a fight. Play simplifying joseki, make shimari, stick to moves you know. Answer contact with nobi instead of hane. Play lots of honte. Don't leave weak groups for Black to attack. Favour territory over large moyos, because Black's power gives him an advantage in invading. Basically, the problem with this fuseki is that it is far too single-minded. All White needs to do is recognise what that purpose is (starting a complicated fight) and play to avoid that. The reason this fuseki works well in amateur (especially kyu-level) play is twofold: first, that most amateurs tend to play a violent, fighting-oriented game (see kyu disease) and second, that amateurs tend to panic when faced with unfamiliar moves, which tends to lead to fighting. If you recognise that, and learn to overcome those tendancies, you will welcome it when someone tries this or the Diamond in the centre on you, because calm, solid play should result in an easy win. The big reason to discourage mirror Go is not that it doesn't pay in the long run, but that it is not fun and not sportsmanlike. That, I think, is not the case with the great wall. Anyone who has a good feeling about the big wall or any other so called single minded fuseki should play it and by playing it become aware of counterstrategies. By the way, I think most amateurs play "zero-minded fuseki". In that sense, the great wall is an improvement. Alex Weldon: Okay. I'll admit that my phrasing was too strong. And it was not my intention to discourage people from trying this fuseki. I'm all for experimentation. However, I was answering a question (Lars Spratz's) about how to play against the fuseki, and I think my advice is correct. 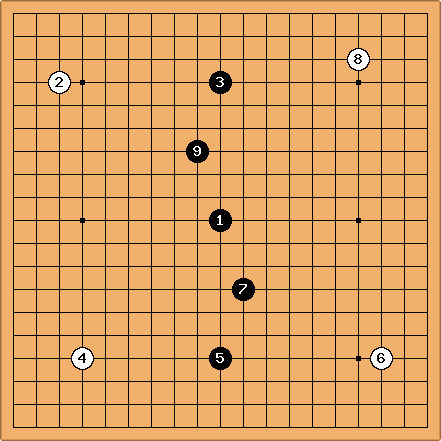 Perhaps a more mild way to phrase it is: when playing against the great wall or big cross, if at any point, you are trying to decide between two moves, one of which is safe and solid, and one of which is faster and more daring, take the safe and solid route. Very weak players may not be able to distinguish between thin and thick moves, or be able to identify variations that lead into complicated fighting. But in that case, it's not really possible to offer any advice to those players about how to play against this opening, and moreover, their opponent (if that opponent is of equal strength) won't know how to exploit this opening any more than they know how to play against it. Tapir: I currently try this in blitz games... with good success up to now. However more often than not i don't finish the wall but play the fifth move as an approach. I wonder about: "According to a professional player, White should prevent the wall from being perfected." vs. "All White needs to do is recognise what that purpose is (starting a complicated fight) and play to avoid that." I have no strong opinion about this opening, but I (try to) believe playing it opens up my mind and is a step towards improvement. Gottago: I once asked Yilun Yang (7P) what he thought about The Great Wall. All he said was "Black is over-concentrated." In practice this variation seems very effective for Black, If White plays conventionally, any attacking moves made begin to create interesting positions for Black everywhere. tesuji: Whoever wrote this doesn't understant Go so well yet. The apparent weaknesses shown as A-H will help any fighting around. White should play solid and not neglect 4th line moves. ferdi: This is the formation Wilcox gives in his book. Bruce Wilcox [3/22/04]: I have added several hundred pages of game record and discussion into my forthcoming Go Dojo: Sector Fights, due out in April 2004. Petri: I've collected Great Wall games from bwilcox account in KGS. I downloaded all of his games and then used kombilo to extract GW ones. Some of those games can be found from the Go Dojo: Sector Fights, but not all. At least 3 ones where wilcox uses it with white stones are missing. Also included two games posted in rec.games.fo while a go from IGS. 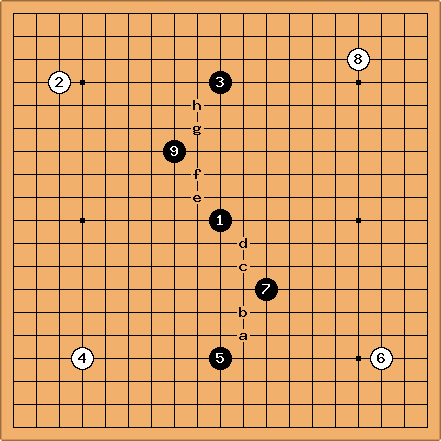 Players using the great wall have similar goals in fuseki as wilcox. I guess they must as there is hardly any other game plan available. They can found from http://sites.google.com/site/xyzzytst/ From there look the subpage. A bit spartan, but serves the sharing purpose. Charles Matthews: I doubt this opening was actually invented by Wilcox. I have seen references to its use by Marseille (?spelling - by the time it has been written in katakana and then romanised ...), an American player active in the 1950s. From what I understand of what he's told me, the wall is used to build side territory while at the same time keeping the opponent's groups separated. If the opponent attempts to attack the wall directly, reroute around the damage (generally using another large knight's move) rather than attempting to patch the puncture wound. This is one reason I believe the wall is kept so loose. Any tighter and it would become impossible to route around the damage, as the attacking stone would threaten the newly created link directly as well. I'm certainly not proficient enough in Go to really know either way, so take the entire preceding passage with a lot of salt. As for the desire for a more thorough explanation of 'sub-optimal' moves, I'll pass along your requests.